You Want White Teeth Without Expensive Over-The-Counter Products? Here's An Inexpensive, Effective Solution. Tip #1 A toothbrush is a toothbrush is a toothbrush... that's what most people think. Surprisingly there are considerable differences in toothbrushes depending on the brand and style. There are budget brands that are totally ineffective, average brands that are barely make the grade, and top of the line brands that get it all the way right. Which one describes your toothbrush? A good tooth brush for everyday care should be firm (not hard), with a lot of closely packed bristles and be easy to grip. 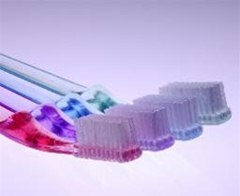 Choosing a good toothbrush is important because it is the first step in a good daily-oral-hygiene program. A good daily-oral-hygiene program includes brushing, flossing, using an oral irrigator (commonly called a waterpik), and rinsing with an anti-bacterial mouthwash. Before beginning take a minute to think about your oral care. Many people brush their teeth religiously and never think about flossing. Why not? Because we have been trained unconsciously by the media to think brushing with a toothbrush and rinsing with a mouthwash is enough. Let's face it...that's all that we ever see in television commercials. Have you ever seen a commercial featuring a model flossing-albeit discreetly-or using an oral irrigator? Mostly your exposure to promotion of flossing and oral irrigation is from your dentist and product ads in your local newspaper or national magazines. Neither of these methods of advertising is effective for promoting significant change. The most effective means for adopting change commercially is through television advertising. A picture is worth a thousand words but a commercial can change lives the world over. Brushing alone is not sufficient. Brushing only cleans the flat surfaces of the teeth so it is not enough to clean the teeth completely. Flossing and using an oral irrigator is the most effective way to clean your teeth. Flossing cleans the hidden tooth surfaces and an oral irrigator washes the dirt away. As for an oral irrigator, have you ever used one? They are fun to use. It is like a shower for your teeth. An oral irrigator uses a comfortable stream of water (you adjust the pressure) to gently wash out food particles and matter between the teeth and around the gums. I even use my oral irrigator on a low setting to wash the inside surfaces of my mouth between the lip and gum. This invigorating wash helps to keep gums healthy. To demonstrate how effective an oral irrigator is: brush your teeth, then use an oral irrigator. You'll be surprised at the number of LARGE food particles that remain between your teeth after brushing! Now back to achieving a brighter smile as this article promises... If you want white teeth, truly naturally, sparkling-white teeth you need to start with a good toothbrush. For this tutorial, you'll need an Oral B flathead (all of the bristles are the same length) toothbrush. You won't get the same results with another brand. Yes, Oral B toothbrushes are expensive ranging from $3.00 for a single manual flathead to over $89.00 for electric pulsating/oscillating/rotating heads. But relax, you won't be incurring a significant monetary commitment with this method. In this article we will only be using the $4.00 manual flathead toothbrush. You can purchase one at any chain drug store across the United States. Immediate improvement! Once finished you should see appreciable improvement in the whiteness of your smile right away. Of note, this is a lay technique. That is, I am not a doctor, but give you a technique used to improve the visual appeal of the teeth. Use your discretion in applying these techniques and speak to your dentist should you have any questions. Oral B manual toothbrushes come in many different sizes. The heads are available from size 30...35...40 up to size 70. Choose a size that feels comfortable in your mouth yet covers the tooth surfaces sufficiently. Additionally, each size of Oral B toothbrush comes in soft and medium. Choose the 'firmness' of your choice. Begin by standing in front of a mirror. Wet your toothbrush quickly under cold running water. Apply gel toothpaste covering the toothbrush fully. Raise your forearm to a 45 degree angle without inserting your toothbrush in your mouth. Your forearm should be raised so that it is parallel to the floor. That is, from your wrist to your elbow, that part of your arm, should be parallel to the floor. It is a habit of comfort to angle the forearm towards the floor when brushing the teeth. This is not the correct means to brush teeth. Why? Here's a little information on the anatomy of the tooth... Tip #3 Each tooth has longitudinal ridges running up and down that are invisible to the naked eye. It is very small food particles, dirt and plaque in these ridges that cause a perceived loss of whiteness of the teeth. By raising the forearm in the manner indicated, you will be cleaning the dirt in the ridges. This is the part most people overlook when brushing their teeth, simply because they do not know this fact. Keep the elbow high so the toothbrush is at the 45 degree angle and goes straight up and down the tooth. Now brush. But watch! Use moderate speed with purposeful strokes on one section at a time. Give about 10 strokes (a stroke is a movement once down and once up) total on each section. A section is the teeth covered by the toothbrush, possibly 2 or 3 teeth. After completing the 10 strokes move to the next section. Now, this is a bit embarrassing, but when moving to the next section, keep your forearm in place and turn your head a fraction! Yes. Only move your head! The toothbrush should land on the next few teeth. Repeat. It may seem funny but the reason for this unusual move is the same. You want to clean in the ridges so you must maintain your posture. The forearm is best able to perform straight up and down strokes when the held at a 45 degree angle right in front of the body. If you were to move the forearm to reach the next section, the forearm would have a tendency to drop some. Then you would be off angle and not brush straight up and down cleaning in the ridges. I hope this is clear. So keep the forearm in place, the elbow high and level with your mouth and turn your head instead. Don't worry. This is a treatment, you won't be performing this radical move everyday. Keep progressing section by section moving around to the first few molars on one side then go back to the front teeth again and move around to the first few molars on the opposite side. Brush as many molars as you can until your cheeks get in the way and you can go no further. Then brush the back molars the way you normally would but go as straight up and down as you possibly can. Look in the mirror to make sure your are doing it correctly and are brushing straight up and down. Be sure to make purposeful strokes. When brushing inner teeth place the toothbrush on the inner surface of the teeth close to the gum and give individual strokes up, up, up, straight up (when doing lower teeth). Don't give a backstroke on this part. For upper teeth do the same in reverse, placing the toothbrush close to the gum and give individual strokes down, down, down, straight down. On the biting surface, brush as normal. Brush over all teeth. Rinse. Peroxide Rinse or Baking Soda Brush? Now make a peroxide solution of 1/2 cup of peroxide and 1/2 cup water. Take a mouth full of peroxide swish, gargle and spit out. Take a second mouth full of peroxide. Don't spit out the solution this time. This is Tip #4 Place your toothbrush in your mouth and lightly brush over all tooth surfaces as you normally would. You can bend over a sink to do this as the peroxide solution will seep out as you brush. Don't worry about posturing here. The idea is to give a final cleansing and whitening rinse with the toothbrush. Do this QUICKLY and VERY LIGHTLY! You can also alternate a baking soda brush in place of the peroxide rinse. In other words, you can use baking soda instead of peroxide. Here's how to do it... after brushing your teeth with the gel toothpaste, dip your toothbrush in the baking soda. Brush over your teeth using the same procedure followed when using the gel toothpaste. However, cut your brushing time in half. Brushing: half the time allotted with the gel toothpaste and the second half of the time allotted with baking soda. Take a mouth full of water swish, gargle and spit out. Take a second mouth full of water. Don't spit out the water this time. This is Tip #4 Place your toothbrush in your mouth and lightly brush over all tooth surfaces as you normally would. You can bend over a sink to do this as the water will seep out as you brush. Don't worry about posturing. The idea here is to give a final cleansing and whitening rinse with the toothbrush. Do this twice QUICKLY and VERY LIGHTLY! Using the dental mirror (if you don't have a dental mirror look in the mirror you use regularly), examine your teeth: the front, sides (move the cheek) and inside surfaces. If you're like most people you'll probably have one or two stubborn stains you have overlooked for some time. Now use the Rite Aid toothbrush to concentrate on just the stain-making small, deliberate, individual strokes in one direction with the tip of the toothbrush. You can apply a small amount of toothpaste or baking soda to the tip if you like. Don't expect to be able to remove the stain in one try. The stain didn't get there in one instance so it will not come off in one instance. It will probably take a few weeks of using this technique concentrating on the stain before it will be completely gone. Every few days (2-3 times a week) work on the stain. Removal of the stain does not have to accompany the treatment. At minimum, the stain removal should be performed once a week. If not, you only allow the same dynamics that created the stain to progress and build up again. You should notice some improvement in the removal of the stain after several tries. Take one final swish of water. Rinse. Your mouth should feel extra clean and invigorated. Now look at your smile, it should be 50% whiter! The recommended time for brushing by the American Dental Association is two minutes. Most people falsely perceive they brush longer than this. You can find out whether or not this is true for you. Try an experiment. Before brushing your teeth normally, set a timer or note the time on a clock. Place the timer or clock out of view. Brush. Stop brushing when you normally would. Look at the timer (or clock) as soon as you stop brushing. What is the time elapsed? Perhaps, you want to adjust your brushing time? Caution: Never brush your teeth too long or too hard. Tooth enamel can be damaged or removed by excess brushing. Tooth enamel once lost, however, cannot be replaced. Although this is not a risky treatment, don't let your actual brushing time extend much past your norm or a maximum of 2 minutes as defined by the American Dental Association. Tip #5 Brush normally 3 times a day after meals, this is necessary. If you cannot brush 3 times a day then brush twice a day. If you employ no other technique given in this tutorial, brushing 2-3 times a day alone will make a significant difference. Use an antibacterial mouthwash which helps stop the growth of germs which will dull the teeth. Use peroxide as a rinse no more than 1-2 times a month. The benefit of peroxide is that it is an excellent whitener and is also a demulcent. A demulcent used as an oral wash is good for getting rid of and preventing build up of putrid matter in small unseen crevices of your teeth, mouth and gums. Buy fluoride in your toothpaste (Closeup has a fluoride toothpaste) or mouthwash. Drink beverages that stain your teeth such as coffee, teas, cola and red wines from a straw. Limit sugary beverages. If you must drink soft drinks and refreshments use a straw so the beverages bypass the teeth. Other options include brushing your teeth afterwards or rinsing with water. The entire treatment should be done 2 times a week for the first two weeks. Thereafter progress to once for the third week, then continually as needed or a maximum of twice a month. I've tried this lay technique on many people and it always works. You'll get instant improvement right away. Maximum results after the 4th or 5th treatment. A Final Word...As you take more interest in your smile and henceforth your dental hygiene, you'll probably want to invest in some of the more advanced dental products. An electric dental flosser (makes flossing easy) and an oral irrigator should be your first options. Both should be used in combination with a good toothbrush as recommended in this tutorial. Additionally you should upgrade to an electric toothbrush. Electric toothbrushes are far more effective than a manual toothbrush delivering up to 3000 strokes per minute. The revolving head toothbrushes are also effective in cleaning the surfaces of the teeth in areas missed when brushing generally. Remember, a pretty naturally-sparkling smile is the reward of good dental hygiene. You speak volumes about yourself when yours is a beautiful smile.